Certain technologies are much better than others at removing different pollutants. With the Surround Multi-Tech 2000, you get the best of the most advanced air purification technologies on the market, all rolled into one air purifier. 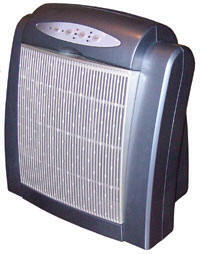 The Multi-Tech 2000 Air Purifier is a very effective air purifier. It has a very powerful fan (106 cfm on high) for high efficiency and large coverage area, up to 400 sq. ft and very affordable replacement filters. The MT 2000 offers a more enlightened approach to air purification on many levels. First, it represents an affordable way to gain the benefit of multiple, proven technologies in one purifier. Now, you do not have to choose between this enlightened, multi-function concept, and an affordable air purifier. The multiple functions include a high-efficiency allergen filter, which is 99.97% efficient at removing airborne particles. Unlike other filters that can serve as breeding grounds for micro-organisms, the Surround Multi-Tech 2000 also features a germ-killing UV lamp. There is also a built-in ionizer, which is proven to enhance the performance of filters. The MT 2000 not only covers you against allergens and micro-organisms, but it also includes an activated carbon filter, which is the most effective way to trap chemicals, odors and cigarette smoke. Other Surround models are in stock. To see the list, click the Enter Store button below.